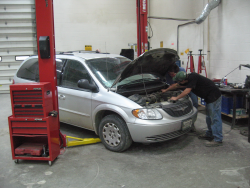 The Automotive Tech II program continues wtih increased lab work to compliment and further develop skills learned in the Automotive Tech I program. This program also adds units providing new knowledge in anti-lock brakes, computerized ignition, front end and suspension, wheel bearings and tires, wheel balance, conventional brakes, manual and automatic transmissions, fuel management systems, scan tools, and special testing equipment. Representatives from a wide variety of technical colleges visit the classroom to provide information and to encourage students to consider furthering their education in the field. Job opportunities in the automotives technologies field include: General Service Technician, Tune-up Technician, Emission Control Technician, Parts Manager, Tire and Wheel Mechanic, Sales Person, and entry level employment in general automotives shops and in small engine repair shops. Prerequisite: Automotive Tech I must be successfully completed before entry into the Automotive Tech II program, unless approved by the instructor.